» The Glory Days Are Back! This Group Dredging Project took place in the lower portion of the Mega-Hole (K-15A) and the upper portion of the Glory-Hole (K-15) along the Klamath River. These long claims adjoin each other at Hwy 96 mile marker 54.17, which is around 11 miles upstream from Happy Camp. There were 15 participants (13 men and 2 woman), not including myself and my 2 experienced helpers, Craig Colt and Ernie Kroo. Longtime active member and Club supporter, Marge Strutt, also volunteered to help the project’s less-experienced participants get through their basics during the first 3 days of the project. Several of the participants were dredging for the first time ever, and several others had little previous experience. One of the primary objectives of these projects is to help all participants achieve personal confidence while dredging underwater. This is a necessary part of making the most productive use of all our helpers during the project. We take this responsibility very serious. It helps a lot when I have an experienced dredger on the project to help with this part. That frees me up to direct the sampling activity early on in the project to locate high-grade gold deposits. Most of us camped in the New 49’er long-term campground at Savage Rapids (K-15A) for duration of the project. 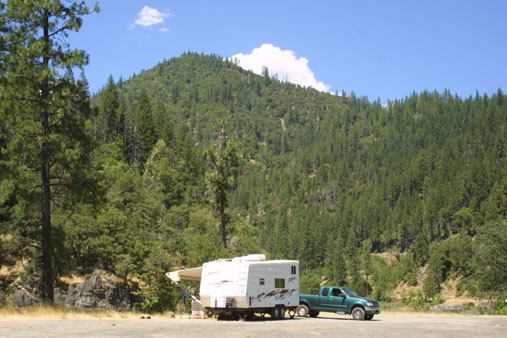 That is a large camping area which extends along both sides of Highway 96, and includes a sizeable pull-off area overlooking the river which is a popular camping area for some members. The nice thing is that this camping area was very close to the places we were working along the river. As other members were also camping and mining in the area, we had an opportunity to spend some of our after-hours visiting and enjoying our time together during this venture. The New 49’ers has access to over 60 miles of mining claims to choose from along the Klamath River and its tributaries during these Group Projects. The options are almost unlimited with this much waterway to choose from. But picking a productive location is the important first step. Because once we launch a Group Project into an area, there is not enough time to withdraw, begin the sampling process somewhere else, and still expect to recover very much gold by the end of the week. So we must choose our location carefully. To help with this, The New 49’ers implemented a cooperative sampling program along the river which started a few weeks before this project. I have spoken about this ongoing sampling program idea in the past few newsletters, and it is really starting to produce some valuable results. Through the ongoing sampling program, we are trying to locate prime areas to launch the Group Mining Projects. This increases the chances of the Group Projects recovering more gold. A side benefit is that we locate some high-grade mining areas along the way – that other members are able to jump right into on their own. In this case, during the few weeks before this latest Group Dredging Project, our common sampling program was joined by members, Ernie Kroo, Jacob Urban, Lilly Fuller, Craig Colt, Gerald & Judy Shirey, Hariof Rothenberger and Kent Gibson. We found several very interesting gold deposits as we worked our way down through the Mega-Hole and into the top end of the Glory Hole. Several of the gold deposits were good; but because of deep or fast water, we ruled them out as areas to pursue a Group Dredging Project. We left those areas behind for other members to work. I have to say something about this: As time goes forward, I am increasingly reminded how lucky we are to have so many members that are interested in participating in cooperative projects that greatly benefit the whole membership. It is remarkable to participate in a sampling activity where we locate high-grade gold deposits and freely turn them over to other members that just happen to be present and are looking for a good place to mine. There is an enormous amount of goodwill in this! In our 20 years as an organized mining group, I do not recall that there was ever a time when morale and goodwill amongst the membership has been at a higher point than it is right now. 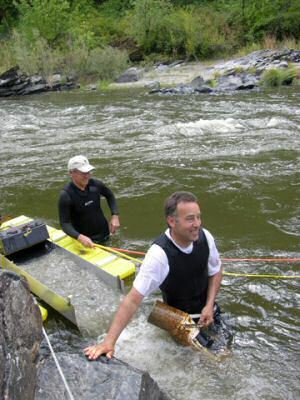 Having some less-experienced-dredgers on a Group Project requires a place where there is some easily-accessible, slower, shallow-water areas so we can get them started, and there is still hope of finding high-grade gold. Our community sampling project located a good gold deposit towards the lower end of the Mega-Hole that is perfect for beginners. I was really pleased about that. Just a little further downriver in the Mega-Hole, we located a second gold deposit out in the middle of the river where the water is only about three feet deep – but moving a little swiftly. So our plan going into this Group Project was to split the group into two separate teams: One to develop the gold deposit in slow, shallow water, and the other to develop the pay-streak in deeper, moving water. Finding a rich gold deposit(s) is one of the few primary objectives that we must accomplish, or we won’t have very much gold to split off at the end of the week. Therefore, doing some advanced sampling takes a lot of pressure off me during these projects. 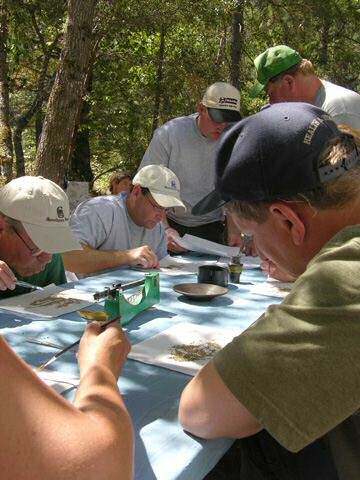 Once the deposit(s) are located, and the less-experienced participants are through their basics and comfortable in the water, the last remaining major objective is to recover as much gold as we can for the week. This all sounds pretty straightforward. But quite often, the best-laid plans fall apart in gold mining about as soon as you start implementing them. So you always have to be flexible. I spent the first few days working with Marge and all the less-experienced helpers on the first team. That part of the program was going pretty well. We clearly established the boundaries of the pay-streak on the first day, even while we were still helping beginners figure out how to breath from a regulator underwater. This was a very easy pay-streak, located on bedrock under about one foot of a gray hard-pack layer of streambed in two feet of water alongside the edge of the river. It does not get much easier than that! This group quickly named itself the “A-Team.” Into the second day of the project, they were already organizing themselves into a production program, taking shifts and doing trial & error routines to push gold production as high as possible. Meanwhile, the more experienced “B-Team” was working very hard to open up the pay-streak we had located further downriver. They were using 5-inch and 6-inch dredges that were tied off next to each other, and running three divers down on each dredge to deal with the deeper streambed material in that location. 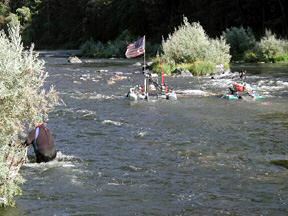 This operation was faced with more serious obstacles to overcome in the river. 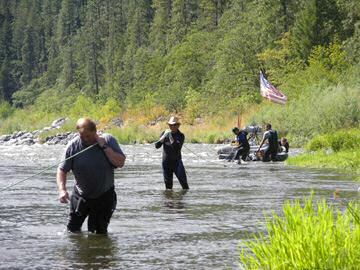 Initially, we were very excited about the B-Team location, because we had located gold on top of, and inside of, original (virgin), gray hard-packed streambed material in the middle of the river, just upstream from where hundreds of ounces of gold were recovered from the Glory Hole several years ago. The potential for extraordinary success is really good in that location! The problem was that by the end of the second day, B-Team still could not find bedrock, and they had excavated a hole through 10 feet of streambed material and boulders! While they were getting some pretty good gold, the deepness of the hole was making it somewhat ineffective to pursue the location using 5-inch and 6-inch dredges. What to do? This is always the question! After a group discussion on the morning of the third day, we unanimously agreed that the best course of action was to split the two dredges from B-Team into a new sampling effort. This was a risky decision. Because if we remained in the original location, we were sure to recover enough gold by the end of the week so that there would be plenty of gold to split off. There was no guarantee that we would locate new, higher-grade gold deposits in the short time allowed to us in the project. These are the same risky, difficult decisions every prospector has to face on his or her own. Do you stay with the sure-thing of a lower-grade deposit? Or do you take a chance of recovering even less gold by sampling around for something better? Ultimately, B-Team opted to sample for something better, while A-Team committed themselves to double their efforts at recovering gold from the pay-streak they were mining further upstream. The gold from the A-Team program was adding up pretty good in our bucket of concentrates going into the third day. 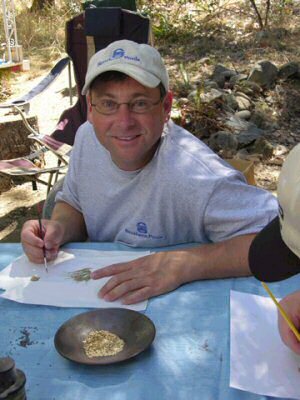 I was very proud to watch the less-experienced team carry the responsibility of gold production, while the more experienced participants devoted themselves to the challenge of finding a richer gold deposit. I’m finding it very interesting that there is clearly an evolution happening in these organized Group Dredging Projects. They are getting better. Because this is the second year we have been doing these Group Projects, we are getting more and more repeat-participants; members who have been involved with earlier projects and already understand what the objectives are and how to reach them. 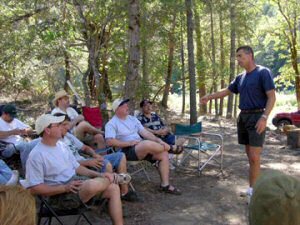 The nature of the projects brings the whole group together in a team-building experience. But usually the team does not really come together until about the 4th or 5th day – after we have surmounted the major challenges associated with sampling to locate high-grade gold. This project was different. Of the 19 people involved, only 7 had not already been on one of these Group Projects. The rest of us started the week knowing where we needed to be as a cohesive team. It was easy for the others to slip right into the team-chemistry. We were in the full team-mode going into the third day when A-team committed themselves to gold production while B-Team dedicated themselves to the pursuit of higher-grade gold deposits. Good team chemistry like this, managed right, in a good gold-bearing area, is near certain to make something good happen. We have found from long experience that the key to finding high-grade gold in a good section of river is to bracket the area with numerous, well-done sample holes in the middle and along both sides of the river. So B-team got busy doing that on day-3. The 5-inch dredge was moved to one side of the river and dropped down to just above the rapids that drop into the Glory-Hole. They were struggling with some pretty fast water there, but were making headway. The 6-inch dredge was moved to the other side of the river, upstream where faster water was coming through two bedrock islands out in the middle of the river. They were investing a lot of effort to get a hole started, too. The hardest part about dredging in fast water is in getting a hole started along the bottom of the river. Once you have even the beginning of a hole, you get a reprieve from the fast water. They were doing it, while I pretty-much stood back and watched. It is best on these Group Projects if the participants work together to overcome the difficulties, rather than stand back and watch me or another supervisor do the hard work. I usually only jump in when my participation is needed to get something accomplished, or when a new important gold strike is made (I can’t resist being in on the discovery of all that gold!). One of the most interesting things we discovered in the lower Mega-Hole is that most of it appears to never have been dredged before. In all our sampling down there during the past several weeks, we have yet to find very much ground where earlier dredgers left tell-tale lose cobbles behind. There seems to be a lot of opportunity remaining there! Ray Phillips gives the thumbs-up signal just after a hot new paystreak was located. Mid-way through the third day, the 6-inch dredge located high-grade pockets of gold on the bedrock under 3 to 5 feet of streambed material that had never been dredged before. Those guys were really feeling good about that! As soon as they were waving to us with the thumbs-up signal that they had struck gold, I went up to take a quick dive to see for myself. Sure enough, we cracked open some bedrock and watched 30 or 40 nice colors go up the suction nozzle. What a great feeling! 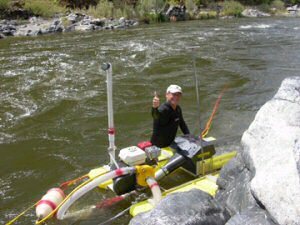 The 5-inch dredge was not yet on bedrock further downriver, and was uncovering rocks too large to move without a winch; so we decided to withdraw from that sample (until another day) and move the 5-inch dredge up to work alongside the 6-inch dredge. At the end of the third day, both teams were working some pretty good pay-streaks. 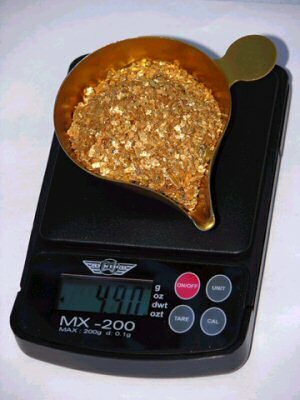 The gold in our concentrate bucket was looking very impressive. We had made a lot of progress on the third day, and everyone was feeling pretty good about it. During these Group Projects, we all meet at camp every morning to discusswhat we are struggling with in the field; subjects like how to move and tie off dredges in different circumstances, how to avoid and cope with plug-ups (when rocks obstruct the flow of material through a dredge system), what to look for in prospecting, how to increase the volume of production, standard operating procedures in teamwork situations; all of the important things people need to know to improve their skills in this field. Mornings are a good time, where we share our experiences, and everyone can get their questions answered. During the morning sessions, we also discuss the progress we have made and make plans for how we will reach the next objective. Objectives change on these projects every day. First, we just want to find some gold. Then we want to find something better. Then we want all the dredges to be producing in gold. Then we are looking for a higher-grade deposit. I’m sure you get the idea. We take it a step at a time, progressing towards where we need to be at the end of the week – which is having plenty of gold to split off. The nice thing about a Group Project, is that we have the resources to send out a sampling team to look for something even better, even while all the rest of the group is working feverously to build up the gold in our concentrate bucket. On the morning of the forth day, we found ourselves with all of the dredges working flat-out in high-grade gold – and not much for me to do but stand around and watch. All the beginners were through all the basics and doing their share of the work on the dredges. Everyone was comfortable doing what they were doing. What was I to do? This was a first for me in these projects. Usually I don’t find myself “standing around” until the 6th day. After some discussion about this, we made a plan for myself and two of our most experienced participants from B-Team, Mike & Jaosn Phillips, to launch a 4-inch dredge into the Glory-Hole and sample some of the deeper, faster-water areas down there – looking for something very special. While launching the 4-inch dredge, we happened across Gerald & Judy Shirey, who had just started sampling in the Glory-Hole themselves. We had no sooner put the 4-inch dredge in the water, and Gerald called us over to show us the gold he was already finding on the other side of the river. For the little bit of bedrock he had uncovered, he was already finding more gold than any of the dredges we were using in the project upstream! But while moving a rock, Gerald pinched one of his fingers bad enough to decide he ought to take a few days off to let it mend. So he offered us the use of his boat, dredge and pay-streak in our Project. How much more generous can you get? It is well known within our industry that the membership of The New 49’ers is made up of kind-hearted, well-meaning people that always seem willing to extend a helping hand to others. The chemistry within our group is something truly wonderful to be part of. Maybe its me that has changed these past few years. I am certainly taking a much more active roll out along the river, working more closely with members, than during past years. Or maybe I just missed it before. But I have never before had so many members jumping in to volunteer their active participation to make the group programs work like what is happening these days – to the point of offering up high-grade pay streaks that have just been found! This is unheard of! Gerald’s pay-streak was on bedrock under about 18 inches of hard-packed streambed along the far edge of the river in the Glory-Hole; an easy place for our A-Team to work if the gold proved out better than where they were mining upstream. To make sure the pay-streak was large enough to justify moving the A-Team and their gear, Mike, Ray & I spent the remainder of the 4th day bracketing the area around Gerald’s hole with more samples using Gerald’s dredge. By the end of the day, we had made 4 or 5 sample holes around the area; and while we were finding gold in every hole, it was not high-grade enough to justify any big movements by the rest of our team. It seemed like Gerald’s discovery was a rich pocket that did not extend out very far. It is good that we found this out before moving a whole team down there! The morning of our 5th day found everyone in great spirits. 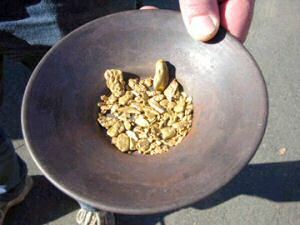 The gold was building up nicely in our concentrate bucket, because both the A & B-Teams had a productive previous day. The whole group agreed that it was best to stay on track mining the two gold deposits, while Mike, Ray & I continued to sample in the Glory Hole. The thing about the Glory Hole is that it is so rich, if you dredge in high-grade gold where no-one has dredged before, even with a 4-inch dredge, you can sometimes recover as much as an ounce per hour of dredging – or even more. So far, in all the holes we dredged around Gerald’s gold deposit, we had not found a single place that had been dredged before. So it was just a matter of finding the strong gold path in the river. We still felt we could do that. From the previous history in that area, my feeling was that the highest-grade gold line is on the opposite side of the river to where Gerald was dredging. 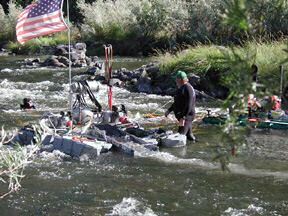 So on the 5th morning, Mike and Ray got an early start using our 4-inch dredge to sample over there. After overseeing the startup of all the other activity, when I arrived in the Glory Hole, Mike was already yelling at me to hurry down and see the nugget they had just found. I thought he was pulling my leg, because they had not been down there very long. But sure enough, they had already found the high-grade gold line on bedrock under 18 inches of hard-packed streambed. Mike pulled the nice nugget right out of a crack in the bedrock. I took a short dive with Mike to have a look for myself, and we almost immediately uncovered a pocket of gold that was full of rice-size pieces of jewelry gold. There was so much gold in the pocket that it took us quite a while to get it all out. After that dive, I approved their request to be named the “Double-G-Team” (“G” for gold). They found the high-grade prize we all are looking for when we go out prospecting. On the morning of the 6th day, we woke up to find that the Klamath River had risen at least a foot overnight and turned green. And it was continuing to rise. Underwater visibility was reduced to about a foot at best. This placed a dark shadow over our production-hopes for the day. Apparently, the Iron Gate Dam upstream increased the water discharge to help signal the Salmon holding offshore that it is time to begin their migration upriver. The result was that the Klamath was running quite a bit faster than the day before, with almost no working visibility along the bottom. Too bad! During our morning planning session, each of the dredge teams agreed that they would attempt to get some production accomplished; but if it was not possible or two dangerous, they would float the equipment out to our planned extraction point. Normally the 7th day of a project is devoted to pulling equipment off the river and final clean up, separation and split of all the gold recovered during the week. After giving it a try, both the A & B -Teams decided it was too dangerous in the places where they were dredging, so they struggled hard with the increased flow of the river to get all their gear safely to the extraction point. 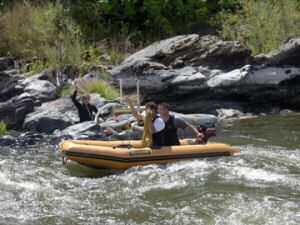 Further downstream, the GG-Team decided they could still be productive, because the streambed material was shallow in their location, and the river was not much faster where they were dredging. 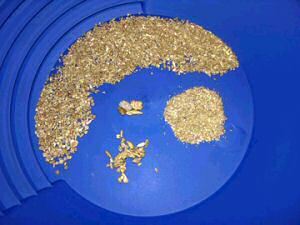 Although the production was slower, they were coping with the lowered visibility and recovering some nice gold. That prompted us to float Gerald’s dredge across the river and expand the GG-Team by adding two more people that wanted to dive. This was a very committed group! At the end of the 6th day, the GG-Team had a respectable amount of jewelry-gold to add to the bucket. It was enough that they decided to meet at 7 AM on Friday morning (7th day) to put in one last dive before the project ended. In all, we recovered nearly 5 ounces of gold for the week, of which 18.2 pennyweights (just under an ounce) were nuggets. Three pay-streaks were located and developed; none of which are being worked by members as I write this newsletter. The pay-streak between the two bedrock islands in the lower Mega-Hole deserves some serious work. The richest place we found down in the Glory-Hole remains relatively untapped.